We're already approaching the end of the first month of the new year, which can mean only one thing: it's time for the first round of Cucina Conversations in 2018! Our theme this month is pane raffermo, or stale bread, which, admittedly, doesn't sound so inviting, but wait! -- don't judge a carb by its cover. Bread past its prime is actually a wonderful, versatile ingredient, its staleness making it sturdy enough to both absorb flavors and other ingredients (good luck making bread pudding or french toast with fresh bread) and add structure to dishes (your favorite meatloaf! Thanksgiving stuffing!) Italian cuisine in particular uses stale bread in many recipes, something that stems from its history as a cucina povera, or a "poor cuisine," born when times were tough, ingredients were humble, and nothing could afford to be wasted. Italians rose magnificently to the occasion, creating delicious dishes that used the modest ingredients at hand -- cornmeal (polenta,) beans, stale bread -- to create delicious dishes that are now mainstays of Italian cuisine. Going back to today’s theme, bruschetta, pappa al pomodoro, ribollita, and panzanella are all Italian dishes that use our pane raffermo as their main ingredient. So! 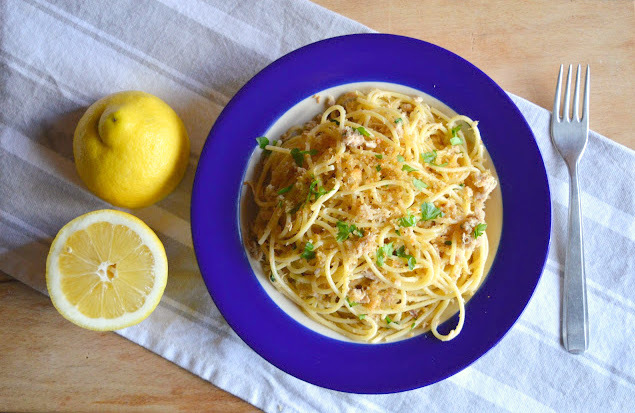 My January contribution is this spaghetti con tonno, pangrattato, e limone, or spaghetti with tuna, lemon, and toasted breadcrumbs made from day-old bread (fun fact: pangrattato means "grated bread"). It's beyond quick to make -- yet another weeknight supper hero -- requires only a few ingredients, and oh, it's pretty darn good too, extra lemon-y (not for the citrus faint of heart) with bright fresh parsley and lots of tuna, and that bread that's seen better days, the bread you meant to eat with dinner and then didn't?! It gets a second life here, steals the show, spiced up with garlic and hot pepper, sautéed in lots of olive oil until rendered crisp and crunchy and fragrant. I devoured the bowl I photographed for lunch, happily -- this is one of those kinds of pastas you eat hot off the stove, twirl-y forkful after twirl-y forkful -- and I predict you'll find yourself doing the same. 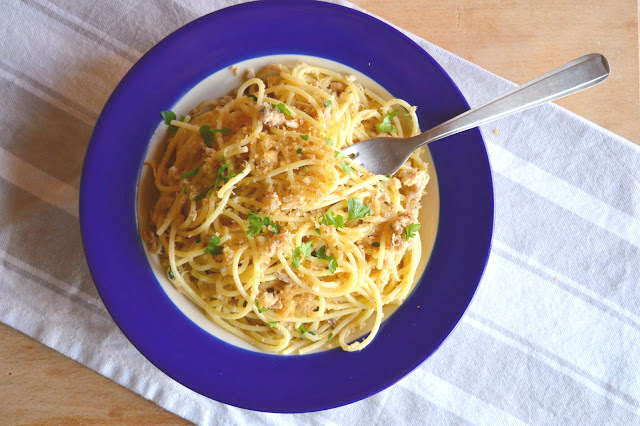 Carmen of The Heirloom Chronicles opted for spaghetti mollicati, or spaghetti with anchovies and breadcrumbs. Last but not least, Rosemarie over at Turin Mamma will be preparing cipolle ripiene alla piemontese, or stuffed onions from Piedmont. A couple of notes on this dish: Feel free to use any cut of pasta you'd like here -- I used spaghetti when I took these photos, but found I prefer a shorter cut of pasta so that the breadcrumbs are more evenly dispersed throughout the dish. Feel free as well to add capers, olives, or tomatoes -- whatever you'd like -- or to substitute basil for the parsley, if you're making this a more summer-y dish. Start with your tuna. 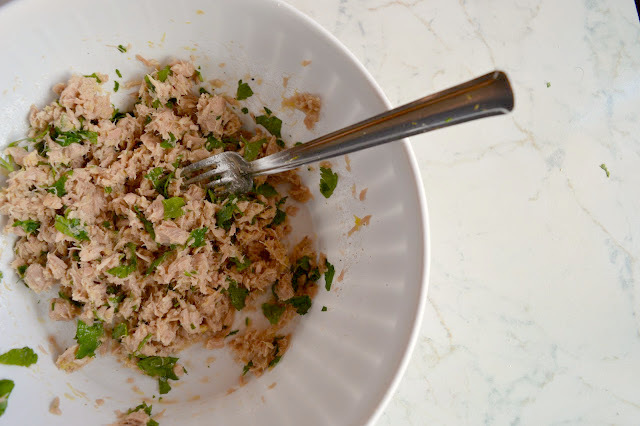 Place the drained tuna in a medium bowl along with the chopped parsley, the lemon zest, the lemon juice, and a pinch of salt and pepper. Stir everything together and set aside to marinate while you prepare your other ingredients. Cut the crust off your bread. To make the pangrattato, you have two options. You can either process the bread in a food processor (I used my mini KitchenAid food processor for this) or you can either grate your bread on a cheese grater, using the largest size grate, which takes a tiny bit more time, but works just as well. 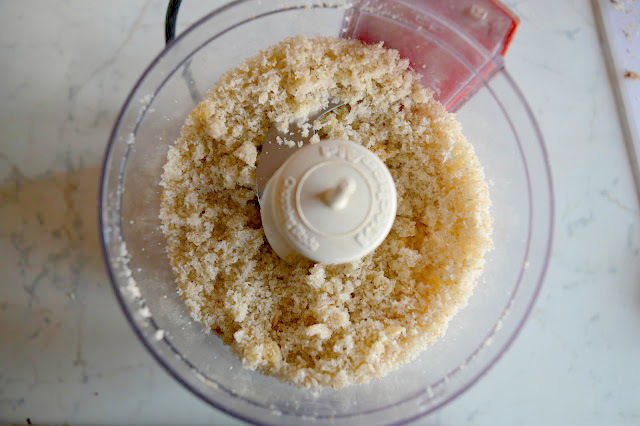 If you’re going to grate the bread, leave the bread in slices, and grate (you’re less likely to accidentally nick your fingers this way) until you have a nice pile of breadcrumbs. 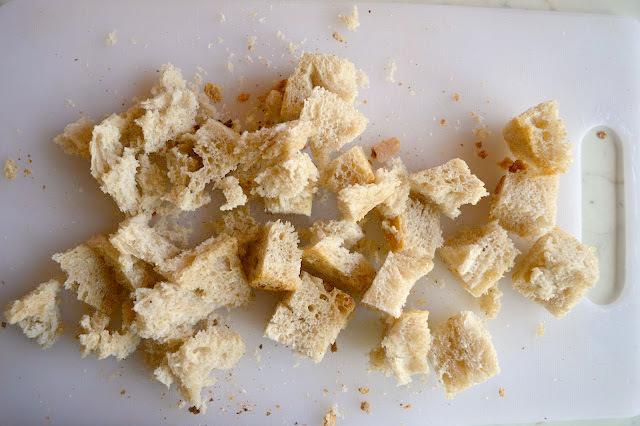 If you’re using the food processor, cut the bread in to cubes and process with a few whirs of the processor until they’re reduced to crumbs. In a large skillet over medium heat, heat 4 or so tablespoons of olive oil along with the smashed garlic clove and the peperoncino. When the garlic clove is lightly browned and the air smells garlicky, remove both the peperoncino and the garlic clove – you now have a nice infused and slightly spicy olive oil. 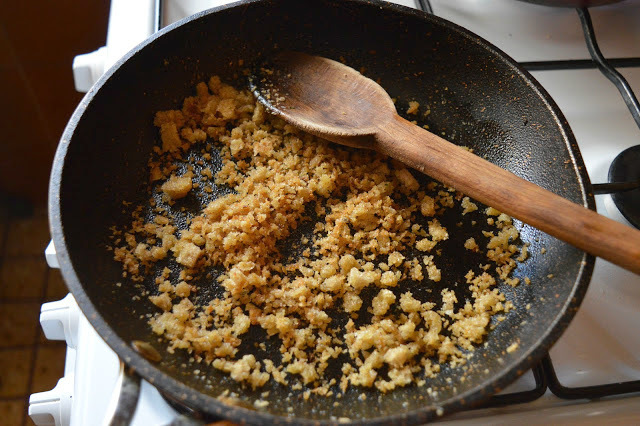 Add about ½ cup (8 tablespoons) of your pangrattato to the olive oil and stir until the crumbs become nice and toasty and golden brown – this should only take a few minutes, but keep an eye on them and be sure to stir so they don’t burn. You might have some pangrattato leftover -- reserve in a tupperware and keep it in the fridge for a few days for the next time you make pangrattato. When your pangrattato is done, reserve about 3 tablespoons of it and set aside. 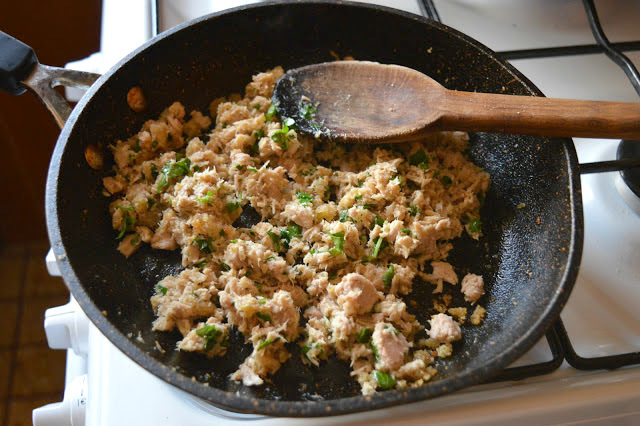 To the rest of the breadcrumbs in the pan, add the tuna mixture and toss over low heat until just warmed throughout. Taste and season the mixture with salt and pepper to taste. Toss the hot spaghetti with the pangrattato/tuna mixture, and serve immediately, garnished with the reserved pangrattato and extra chopped parsley, if you’d like. Serves 2-3 generously. This pasta sounds absolutely amazing! I'll be trying it very soon! g entire nourishment into little particles with a ton of surface territory, blending with spit to present compounds. Twisted Treats E-Juice is Liquid EFX latest specialty line by introducing hit new flavor – Oooh My Mango that will take your taste buds on a nostalgic ride. Our Oooh My Mango E Juice by Twisted Treats is a sweet mango experience swirled with velvet ice cream and combined in a yummy milkshake.